Can you confirm these amateur observations of Storeria hidalgoensis? Types Holotype: INHS (= UIMNH) 25061 (16145); E. H. Taylor; August 13, 1938. Comment Storeria hidalgoensis is not diagnosable morphologically from S. occipitomaculata (Taylor, 1942), and may not represent a valid species. All scalation characters are also occasionally subject to rare individual variation (Ernst & Ernst, 2003). Thus, Pyron et al. 2016 synonymized S. ’hidalgoensis’ with S. occipitomaculata following previous authors (Trapido, 1944). Smith,H.M. & Smith,R.B. 1976. 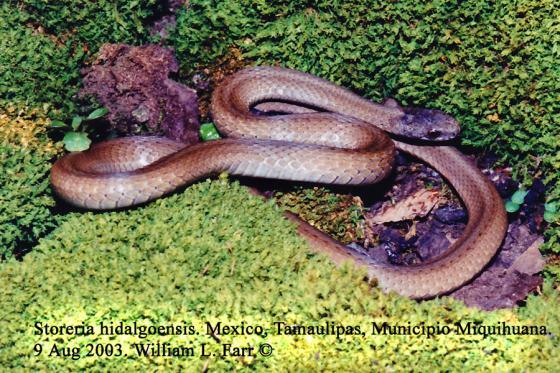 Synopsis of the Herpetofauna of Mexico. Vol. III. Source analysis and index for Mexican reptiles. John Johnson, North Bennington, Vermont.